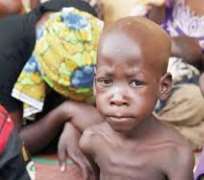 Borno State Ministry of Health on Saturday called for an emergency meeting to cross check with health officials in Bama before deployment of a rapid response team following media reports of some children's death ‎as a result of acute malnutrition. The State Commissioner of Health, Dr Haruna Mshelia, a senior health practitioner with over 35 years experience, said in a statement that reported development was surprising given measures adopted in June, 2016 which had kept re-occurrence of malnutrition amongst children and some parents who had been under Boko Haram’s captivity or entrapment before they were freed by the military. Officials had at the time attributed malnutrition to years of hunger during captivity. Governor Shettima had visited Bama twice to personally supervise evacuation of affected children and adults to a special treatment center established by the State Government in Maiduguri. It was not clear what may have caused the recent malnutrition which was made known by the MSF, a body of medical humanitarian aide. Thousands of citizens have returned to Bama town with majority living in their homes which were rebuilt by the Borno Government with some amount of support from Dangote Foundation and the Victims Support Fund, set up by the federal government. Majority of citizens in Bama currently live outside existing IDP camps. The MSF said the cases of death-caused malnutrition happened in an IDP camp apparently occupied by persons not from Bama town. They may have been citizens of villages liberated by the military or those dealing with complexities associated with conflicts, officials explained. Borno State health Commissioner, Mshelia said his ministry was already assessing the situation for appropriate response. He said the ministry has men on ground in Bama but would deploy a rapid response team after findings. He thanked the international and local humanitarian workers for their continued collaboration with the State Government in handling medical ‎needs of displaced persons.